Okay, this may not be a pie chart, exactly, but it's like someone entered my brain while I was in the shower, oh, ANYTIME OVER THE LAST THREE DECADES and then made a colorful graphic out of what they found there. I have always maintained that my shower lever could easily be modified to have a two-inch radius instead of an eight-inch radius, because the range of water temperatures that it offers certainly doesn't require that much navigation. AND every hotel tub should have instructions on the way their faucet works!!!! I loved this chart... My husband and I have made it a running joke since it came out. Too funny, and unfortunately too true! Our shower handle would be blue from right to left almost completely with a hint of aqua at the left. No green, no red. Wishful thinking on our part. 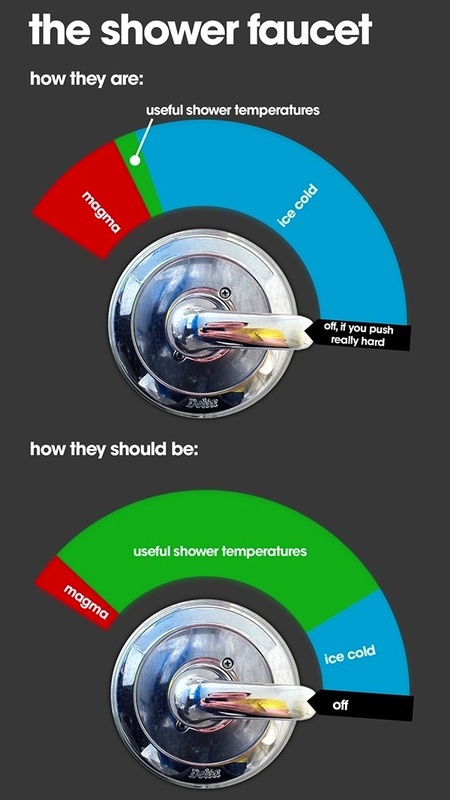 I'm a magma shower girl, too, Paige. I come out of the shower red like a lobster. Except when I'm pregnant and it's prohibited. Shanemotb, it truly is SO representative of the real thing! Rachel, I have to have red. HAVE TO.